The company was created to allow visitors to sail through Scotland's Caledonian Canal, which was originally completed in 1822 and links the natural lakes (lochs) in the region (Dochfour, Ness, Oich and Loch Lochy). Over time, however, the vessels that utilized the canal became too large for it, and commercial use all but disappeared. Today, the canal is used primarily by pleasure crafts for visitors wanting to get from one side of Scotland to the other. Magna Carta Steamship Company purchased a Greek-built small ship, circa 1985, and had it completely retrofitted in Spanish shipyards in 2000 to comply with British Maritime Law, turning it into a luxury yacht that's capable of navigating the waters of Scotland. Staterooms can be either twin or double and have showers, televisions, internal telephones, air-conditioning, safes, dressing tables, music systems, hair dryers and robes. Two of the cabins have two portholes, rather than large windows. The Robert Louis Stevenson restaurant is capable of accommodating 60 at one time, and there is open seating for all meals. Breakfast, lunch and supper feature local ingredients that are provisioned along the way -- salmon, fine Angus beef or game. Villeroy and Boch service pieces dress the elegant tables. Dress is country-club casual with jackets and cocktail attire requested on the more formal evenings. Meals can also be taken on the terraces. The restaurant is set up for entertainment and audio-visual presentations. The forward lounge is comfortable, offering great seating options and windows forward and along both sides. The aft lounge has a sit-up bar and library, with panoramic side-view windows and access to the aft terrace. There is also an open bridge, which guests may visit at any time. Since the vessel is close to land at all times, there is no medical center onboard. When the yacht is operating its four-night itineraries, it hosts guests visiting the British Isles from all over the world. When it's chartered to Lindblad Expeditions, most of the guests are from the U.S. The typical guest is well-heeled, middle-aged and looking for soft-adventure without sacrificing comfort and convenience. Most also have an avid interest in the history and beauty of the region. The yacht is not suitable for families. Lord of the Glens is the company's sole vessel. It offers 27 outside staterooms, a dining room, bar and lounge, sun decks fore and aft and a library/lounge. Decor throughout is clubby manor-house, with warm teak- and mahogany-lined walls. Staterooms are spread over three decks; the top deck is all public space. During much of the year, the yacht operates four-night cruises with three separate itineraries. The "Memories of Scotland" cruise calls at Glasgow, Loch Long (Loch Lomond), Loch Fyne, Mull of Kintyre, Isle of Arran and Isle of Bute. 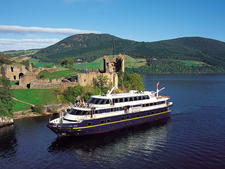 The "Highland Cruise of Scotland" sails the inland waterway of the Caledonian Canal from Inverness to Fort William (Banavie), including Loch Dochfour, Loch Ness, Loch Oich and Loch Lochy. The third itinerary, operated during the spring and fall, is the "Spring and Autumn in the Highlands" cruise, which combines the features of the other two but offers an open itinerary, due to weather and tide conditions. When the vessel is chartered to Lindblad Expeditions, an 11-night cruise is offered. The voyage offered in June and July is called "Heart of the Highlands." The journey begins in Inverness and includes voyages to the Inner and Outer Hebrides, several lochs and, of course, the Caledonian Canal. In August, the voyage is similar with the addition of Edinburgh's Military Tattoo.